While the Olivier Awards have upped the ante in the glamour stakes by relocating for the last two years to the Royal Albert Hall, New York’s Tony Awards still take some beating in terms of profile and prestige. Now in their 72nd year, they have, since 1947, been broadcast live on national television, bringing the Great White Way to every village, town, and metropolis far beyond New York for one night a year (and on YouTube forever after). The Oliviers, by comparison, have a highlights package broadcast on ITV after the event. The Tonys are truly synonymous with Broadway, as a gold standard of officially anointed excellence that not only translates into giving the rewarded shows a local branding but also an international one. Most of the titles in contention for this year’s awards were brand names already, from the global franchises of Harry Potter and Disney’s Frozen to another animated cartoon title SpongeBob SquarePants, the film Mean Girls and revivals of two golden-age musicals, My Fair Lady and Carousel. But, as shows seem to run ever longer, the pool of available real estate for new shows gets smaller with each new hit. So, this year’s winners are drawn from one of the most exclusive lists in Tony history: the paltry listing of 30 eligible new productions to have opened across the season. That’s a 25% drop on the previous year’s 40 openings – and a marked difference from the 1927/28 season, which predates the Tonys, when there were a whopping 264 openings, including 183 new plays and 53 new musicals. With the arrival of this year’s new long-term properties, some 26 of the 41 designated Broadway theatres are booked for the foreseeable future. Tony glory accentuates this trend, extending the runs of its winners and giving them national touring legs for the all-important regional circuit. But Broadway is also famously a disrupter as well as a consolidator of existing trends, reinventing the genre it provides a home to, as well as welcoming new talent. Among the latter, according to playbill.com, of the 130 Tony-nominated artists this year, 59 are first-time nominees, and 34 of them made their Broadway debuts. All four writers nominated for best book of a musical were making their debuts: Itamar Moses (who took home the award for The Band’s Visit), Jennifer Lee (Frozen), Tina Fey (Mean Girls) and Kyle Jarrow (SpongeBob SquarePants). But it is perhaps significant that the headline winner this year was The Band’s Visit – taking nine other awards, including best musical. Though based on a film, it was not a blockbuster with immediate title recognition or a cult following, but a relatively unsung 2007 Israeli comedy-drama about an Egyptian ceremonial police orchestra who arrive to play at a cultural centre in Israel, only to discover they have come to the wrong place. It is a delicately textured, quirky musical about outsiders that disarms with its gentle romanticism and lyricism. As a result of its success, it knocked the other principal front-runners out of the competition almost entirely. Mean Girls, which had 12 nominations, went away empty handed, while SpongeBob SquarePants, which also had 12 nominations, only turned one of them into a win (for David Zinn’s scenic design). Meanwhile, one of the biggest surprises of the night was the triumph of the new production of the 1990 Ahrens and Flaherty musical Once on This Island, which was named best musical revival over the competing claims of two golden age classics, My Fair Lady and Carousel. 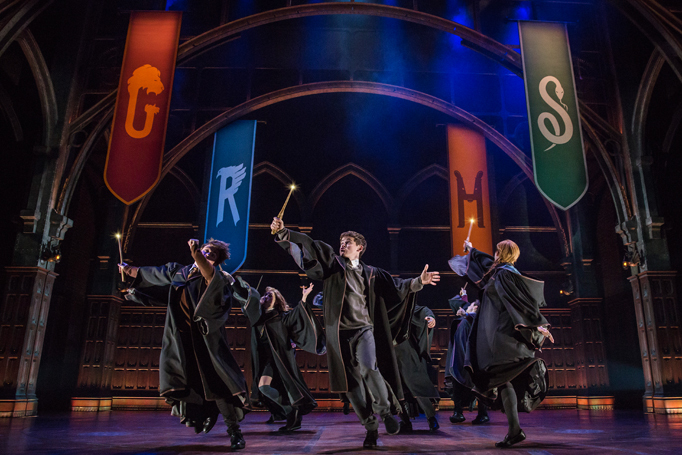 On the plays front, the Tonys generally matter less commercially speaking than the musical awards, since they are not typically booked for open-ended runs, but this year was an exception with the arrival of Harry Potter and the Cursed Child. It is also a brilliant show and the Tonys recognised that with six awards, including best play. Its winners were among a strong showing of British onstage and offstage talent that also saw Glenda Jackson’s Broadway return, in Edward Albee’s Three Tall Women, win her the leading actress award and dual citizen Andrew Garfield (US-born but raised in Britain) win the leading actor award for Angels in America. That show, originated at the National Theatre before transferring to Broadway, also took Tonys for best revival of a play and for Nathan Lane as best featured actor. Her students have carried this message to the world. At the Tonys, they proved it, too, performing ‘Seasons of Love’ from the musical Rent.